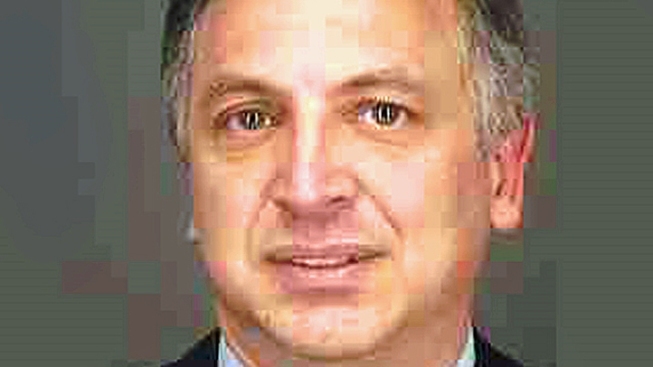 The ex-mayor of one of New York's major suburbs was sentenced Thursday to three years' probation for domestic violence and was told to stay away permanently from his estranged wife. Acting state Supreme Court Justice Susan Capeci criticized former White Plains mayor Adam Bradley for continuing to claim that he was the victim in the case but she said she was taking into account his clean record. The 49-year-old Democrat was convicted in December and resigned last month after barely a year in office. When he was elected in 2009, the former state assemblyman was considered a politician on the rise. Bradley's wife, Fumiko Bradley, alleged that he slammed a door on her fingers and threw hot tea at her. The couple has two young daughters and are in divorce proceedings. A statement from his wife, in which she mentioned that some women never come forward in domestic violence cases, was read at the sentencing by one of the prosecutors. "I was married to a powerful politician and afraid what would happen to my children and me if I broke the silence. I want this case to show that there is justice and hope for anybody to be free from violence." Bradley took office in January 2010. He was in just his second month as mayor when he was arrested on his wife's complaint. White Plains, a city of about 60,000, is the Westchester County seat and a major office and retail center 22 miles north of Manhattan. The mayor resisted calls for his resignation even after his conviction. But on Feb. 18, Bradley said he had to spend more time on his appeal than a mayor can afford. "I can no longer allow the circumstances of my personal life to be a distraction" from the city's needs, Bradley said. He did not mention his wife. She testified in court that he commonly harassed her, in addition to the door-slamming and tea-throwing incidents. She claimed he told her the criminal case would cost him his career and she should admit herself to a mental hospital to cast doubt on her allegations. The mayor said his wife was making up the charges. He said it was she who regularly punched, pushed and berated him. "I never responded physically to my wife's assaults, ever," he said.